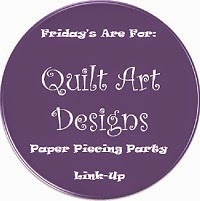 Quilt Art Design: Friday Party Time! Link up your amazing creations and visit a few.... be nice! Big fan of tree quilts here. Yours is beautiful! I love that you used traditional prints for backgrounds as opposed to 'landscape' fabrics...very inspiring! I love your tree blocks - very cool! Whoop whoop!! I just love those trees SO MUCH! I honestly cannot describe why, maybe it is the effect of movement. The design makes them feel like they are swaying in the wind. This effect is especially working on the block in the bottom right corner because it feels like the leaves on the background fabric are being blown. OK, love this quilt! How did I not know that there was a Paper Piecing Friday? How fun is that!